To read effectively, you need to learn thousands of words, mostly by rote. Flashcards are the tool par excellence for rote memorization, but, unfortunately, they become unwieldy beyond a few hundred cards. Anki is a free computer program that lets you comfortably manage the thousands of cards you'll need if you want to comfortably read books in foreign languages. 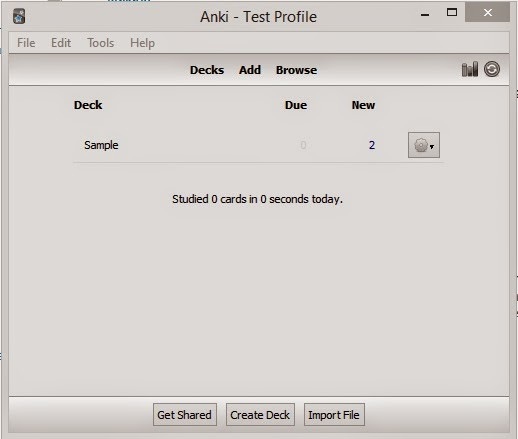 This posting discusses how I use Anki, and shows you how to set up decks the same way I do. In its simplest form, a flashcard is a 3×5 index card with an English word or phrase (e.g. "to walk") written on one side and the corresponding foreign word (e.g. marcher) on the reverse. Make cards for the vocabulary you want to learn, shuffle the deck, and voila: instant random vocabulary quiz. Deal the cards one at a time and try to guess what's on the other side. Ones you get right go into a discard pile. Wrong ones you stick back into the middle of the deck. When you have discarded all the cards, reshuffle the deck and repeat until you can make a pass without any mistakes. The astonishing thing about flashcards is how fast you learn. On the first pass, you typically get up to half the words because the simple act of creating the cards has taught you that much. On the second pass, that jumps to 90% or more. On the third or fourth pass, you get all or all but one or two, and by that point you're zipping through the cards just as fast as you can deal them. Drilling with flashcards is fast, effective, and immensely satisfying. It's hard to imagine mastering a language without them. But you really don't want to do this with paper cards. What's the Problem with Paper Flashcards? Beyond one or two hundred cards the deck becomes impossible to shuffle. No matter how fast as you are, a quiz with hundreds of cards takes a long time. The deck fills up with words you know really well, and you start to feel you're wasting time reviewing them over and over. You can avoid this by making multiple decks. That works to some degree for a language class, where you make a new deck for each new lesson and you don't review the old ones until exam time, when you dump them all together for a few marathon study sessions. If you do it that way, you'll find you retain some words pretty well, even after weeks, while you forget others almost at once. That may be okay for passing quizzes, but it's not what you need if your objective is to actually use the language. What you really want is a system that separates the "easy" cards from the hard ones. In other words, you want the computer to organize it for you. It's showing me the English side of the card and prompting me to type the French translation of "to walk" in the box. The phrase "move on feet" is a hint which I put there to remind me that this does not mean "walk the dog," which would require a different verb in French. The green highlight on the word I typed means that my answer completely agreed with the expected answer. Below it is the content of the French side of the card plus the pronunciation of the word. I can press any of the three buttons below that to indicate whether I got the word wrong ("Again") or got it right ("Good") or thought it was really easy ("Easy"). The numbers above the buttons indicate how long Anki will wait before showing me this card again. Cards that you get right over and over are rescheduled further and further into the future so you don't waste time going over them again and again. 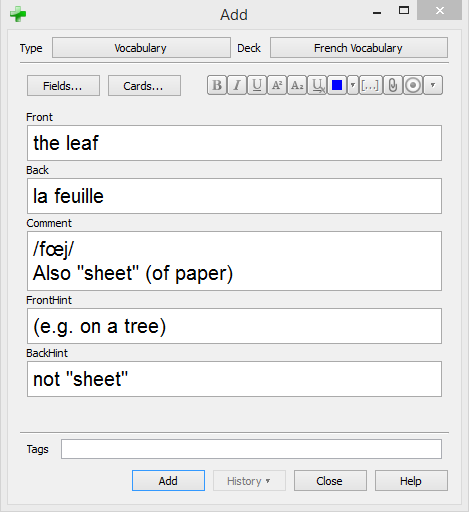 Unlike a physical flashcard deck, Anki treats the French-to-English cards as being separate from the English-to-French ones. That makes sense because, for example, it is much easier to guess that extrême means "extreme" but much harder to remember that the French word needs a circumflex on the second 'e'. 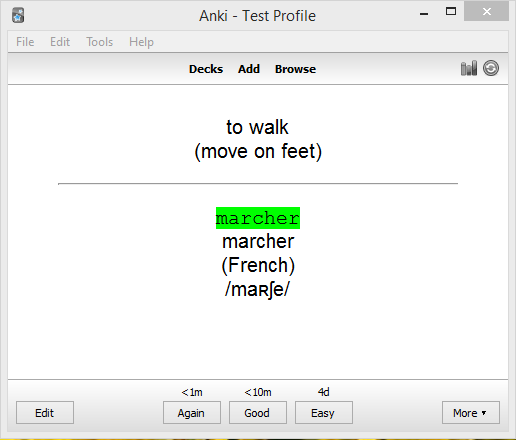 Whenever you do a drill, Anki mixes both kinds together. That is, some cards will show you English and expect French while others will show you French and expect English. Notice a couple of things about these cards: First, I only have to type the words, not the hints. Second, the pronunciation never appears with the question--only with the answer. That's very helpful because if it appeared with the English question, it would give the word away, but if it appeared with the French question, then I couldn't use it to help practice pronouncing the word. Always having it on the answer side means I can pronounce the French word out loud before I flip the card and then check myself. As always, it's up to me whether I count a pronunciation error as a serious enough error to call the card wrong. 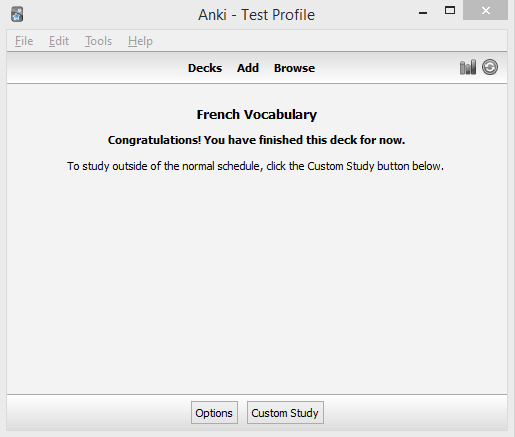 Every day, Anki decides which cards you need to review (again, counting French-to-English as separate cards from English-to-French) and sets up a drill for you. It limits the drill to 100 cards (even if you skip a day), and you can stop in the middle of a drill and resume later (or not) if you need to. 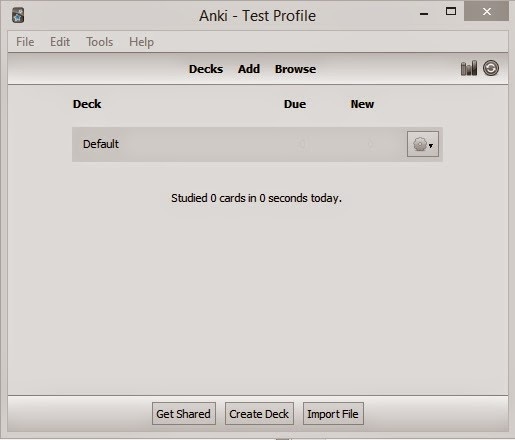 When you're done with the drill, every card will have a new review date, and Anki can show you some cool statistics to help you track how well you're doing. For complete information, as always, read the manual. Anki has lots and lots of features. The first thing you need to do is go to the Anki Website and download the program. Yes, this is a program, not a web application, so you actually have to install it on your PC. Don't worry--it's worth it. Yours won't say "Test Profile," most likely. There's no reason to name the profile until you want to have more than one, so don't worry about that for now. I didn't need a second profile until I wrote this article. 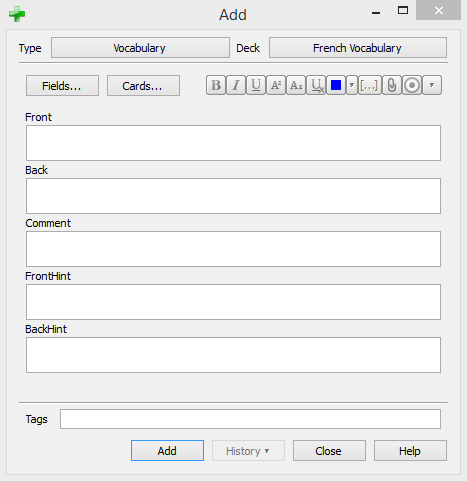 The Anki User manual gives you lots of options for configuring a deck, but none of the defaults was quite what I wanted, and I went through a good bit of trial and error before I had something I was happy with. To make this easier for others, I have created a trivial sample deck. You can download it from here. The file called Sample.apkg is the one you want. 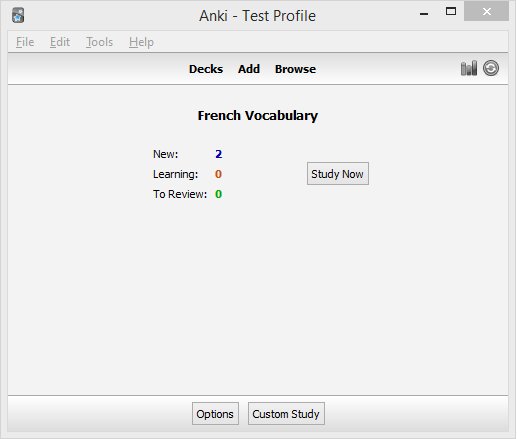 If you've already installed Anki, simply download Sample.apkg and open it. That should cause Anki to import the Sample deck. Or you can just copy the file to your PC and import it manually. To do a manual import after you've downloaded Sample.apkg, run Anki, click on the File menu and select Import. We've only downloaded the Sample deck so we can use the card type "Vocabulary," which is inside it. As soon as you have created a deck of your own, you can delete "Sample." Click on the "Create Deck" button at the bottom of the dialogue box. Give your deck a reasonable name like "French Vocabulary." Click on your new, completely empty deck. You may need to resize it to get it all to show. Be sure it says "Vocabulary" in the upper left-hand corner (after the word "Type"). If not, click on whatever type is does say and select "Vocabulary" from the list. The whole point of downloading my Sample deck was to get you the Vocabulary type because it describes the layout of the cards and defines the fields. So let's create a card. As you can see, we have five fields to fill in. Let's take them one by one. Front: This is where you put the English word. I follow the rule that I always put "the" with nouns and "to" with infinitives, which helps me distinguish "to walk" from "the walk". Use a word from the language you're actually studying. This time I'll use "the leaf." Back: This is where you put the word in the language you're studying. In this case, I'll put la feuille. The next three fields are all optional, but when you need them, they're very useful. Comment: This field that always shows with the answer but never with the question. I'll put the pronunciation here, but you can put anything you want there. I get the pronunciations from WordReference. In fact, to be safe, I like to copy the text from the Back field and paste it into WordReference just to be sure I didn't mistype it. That also tells me if the word has multiple meanings. Then I can click on the English word (still in WordReference) and see if that has multiple meanings. When there's ambiguity, I use the next two fields to clear it up. FrontHint: This is shown with the English word, but it isn't part of the answer when you're drilling from French to English. I use this for three purposes: first, as in the "to walk" example, to clarify which meaning of the English word I want. "move on two feet" clarifies that I don't mean "e.g. walk your dog." For "leaf" I can say "e.g. on a tree." The second reason I use a hint is when the target language has synonyms and I want to be clear which one I want. For example, cependant and pourtant in French both mean "yet" or "however". The difference is that cependant augments the first clause while poutrant contradicts it, but this is way too complicated to express in the hint. Instead, I just put "not pourtant" or "not cependant". The long explanation can go into the Comment field. BackHint: This field works just like the FrontHint, except that you see it with the French word. It's very important not to give too much away in this field. I want to memorize the French words--not my hints. I in this case, I feel safe saying "not sheet," and I add a bit more explanation to the Comment field. Here's what it looks like all filled out. Again, don't bother with the three optional fields unless you need them; there's no reason to make extra work for yourself. Now click the "Add" button. This actually adds two cards: an English-to-French one and a French-to-English one. 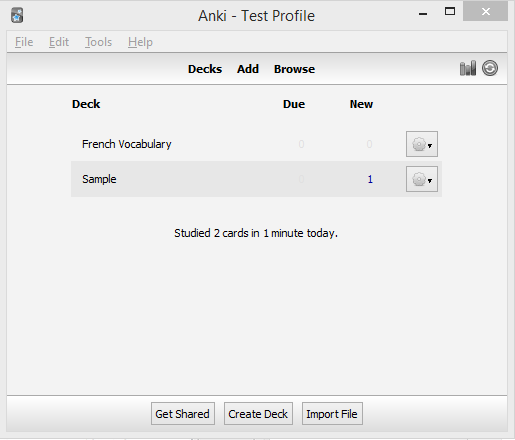 In Anki terms we have created a single "note" which comprises two "cards." You create and edit notes but you drill on cards. If you realize you have made a mistake, you can click on the "History" button and it will let you edit the earlier notes (and this will fix both cards). If you look back at my examples of what a quiz looks like, you'll notice there is an "Edit" button in the lower left corner. That lets you edit notes in the same way even in the middle of a quiz. Press the "Study Now" button and see how you do! 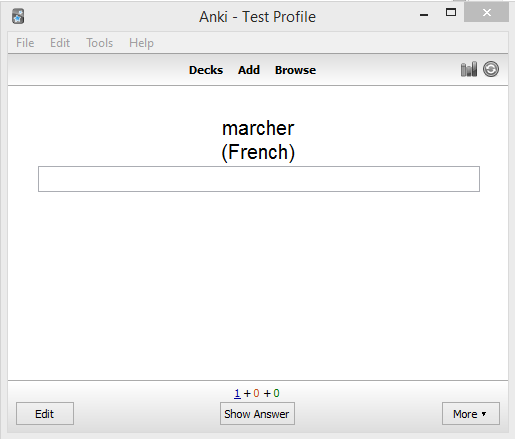 In a future post, I'll offer some tips and tricks to get the most out of Anki. Very interesting article. I am learning french now and every help, tip, trick is helpful. I use Anki as a fundamental part of learning. Sometimes I create a deck with specific questions all centering around a difficulty I am having and just drill to kill. Once the issue is taken care of, I delete the deck, while continuing to use the pre-built shared decks that are available from Anki. I use Duolingo, Memrise and Anki and consider them all to be basic parts of a day's learning. Just different aspects of the learning process. Each one has its own but complimentary focus. Great article! I had a question though. Have you found or maybe thought of a way that one could program in multiple options that would essentially allow for multiple correct answers and still have this basic format for the card work? What I do is list the alternate valid answers in the Comment field. Then, even though I didn't give the preferred answer, I still give myself credit if I supplied any of the alternative ones. I've only had to do this a few times, though. Usually I can find some nuance that lets me craft a hint to tell them apart. Or instead of drilling the words, I drill short phrases. Thanks so much for telling us about Anki! I was getting into a problem with all the flashcards getting unwieldy and creating a lot of clutter. For some reason this works faster anyway.